What are “Suggested Clip” Featured Snippets, and How Do You Earn Them? I would like to share some new featured snippets — video featured snippets. They are suggested clips. I am going to show you how to earn them, let you know what the heck they are in a quick video so you can go about snagging some of them for yourself. Let’s dive in. What is a suggested clip featured snippet? 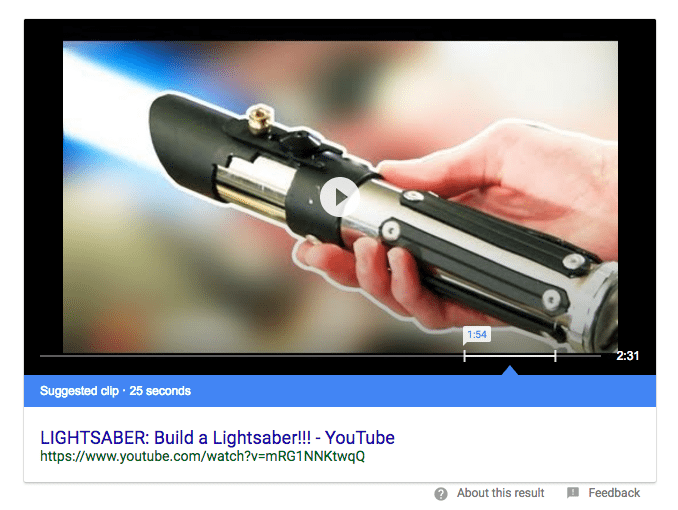 Essentially, a suggested clip is a kind of special video featured snippet. 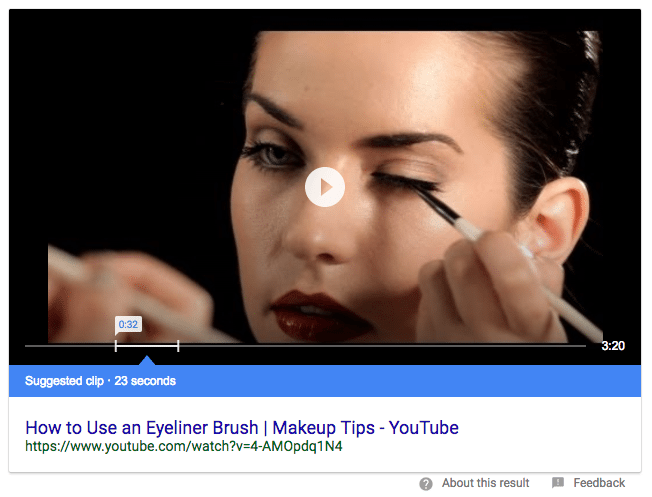 It is new and it is where Google highlights a specific section of a video to answer your specific search query. It’ll be a lot clearer for me to just show you. For example, I’ve searched how to make a lightsaber because I’m a nerd. You can see here, this is probably different than what you are used to seeing. A lot of times you will see just videos in the search and we are all used to that, right? In this case, it is the same video, but they have highlighted a section of it and that is the suggested clip part. You can see it is a 2-minute and 31-second video, but Google is saying, “These 24 seconds, I think, will answer your question.” I hit play, notice it doesn’t take me actually to YouTube. It is just a module that pops up and that is kind of interesting as well. Although, I do have the typical YouTube controls. Let’s look at another example. This one is how to use an eyeliner brush. Again, you can see that they are saying, “These 23 seconds, starting at the 32-second mark, we think that’s what you want out of this 3-minute video.” If we hit play, notice it is a start of a suggested clip. If you watch to the end, not just the end of the video, but the end of their suggested clip, it’ll say, “End of suggested clip,” which is kind of interesting as well. You need to rank your video in the top 10. Each one of these, I’ve never seen a suggested clip that didn’t also have a listing in the top 10. So you need a video listing in the top 10. What I would suggest you do is audit your existing video content, and see if you have any in the top 10 that you could optimize, or look for video keywords that you could take down with new content, new video content. After you rank in the top 10, make sure that you have uploaded a very clear transcript. This will allow Google to have a written copy of what is being said, so that they know very clearly what she’s saying as her tips. 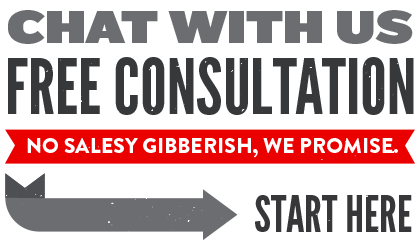 That is also because the transcript has been corrected. So she’s uploaded a transcript or gone in and corrected the auto-generated one. I have found — maybe it is my voice, not sure — but it is a 50/50 crap shoot what comes out of the auto-generated transcript. I always have to go in and fix those up or submit my own transcript. That is going to help Google really understand, the context of your videos so that you are set up to earn those featured snippets and earn those suggested clips. This is a very similar step, but it has to do with your description. You want a very detailed description. You can see she has a very detailed description here as well. Now, I think she’s gone a little overboard and uploaded the transcript as the description. I don’t think you need to do that because, in step two, you’ve already done that with the transcript. But you’ll notice in the video that I upload today, this video, look at the description. I will definitely put in there the usual, “Oh, check this out, it’s going to teach you how to do this,” but I’ll put in the exact three steps that I’m telling you here, so that Google is just backing up the transcript and another place for Google to pull featured snippet data from. This is a simple three-step process you can use to earn these snippets. If you are kind of worried, like, “Well, this is new, it’s kind of experimental,” Do not be. Downside, if you can optimize your YouTube videos better, you can rank here, right? You can get a really high engagement ranking. Upside is, maybe you get a double-listing, you get the suggested clip and the video. Now, a bonus tip would be that, for the suggested clips I am mainly seeing them around how-to type content. If I were making new content, or if I were editing videos, I would definitely start with things that are how-to and have various specific steps to do. That tends to work, so start there. These are new, so they are a little hard to spot. If you find any, link to them in the comments and let me know about them. Then hit me up in the comments or as always on Twitter, @SEO, and let me know if you’re able to earn any video featured snippets or any of the suggested clips. This is a very interesting topic. We are starting to land snippets without being in the top 10 for that pertaining keyword or phrases. It’s nice to be able to land above people with simply better onsite SEO strats. It really helped us pick up some momentum surrounding similar words! Awesome to hear! Can you share an example SERP that you are earning the snippet without ranking in the top 10? It is pretty rare for that to happen so I would love to see the example. That sounds good, prefer to do it privately as releasing it here ‘could’ impact our companies revenue. Please use our live chat feature and I’ll be able to bring anyone else into the conversation if we are booked!